Founding curator of Gallery Emanuel steps down to brush up on her own creations. Surrounded by other people’s art for the past 10 years as curator of Gallery Emanuel, Liz Gribin decided it was time to envelop herself in her own works. So after staging countless shows at Temple Emanuel of Great Neck, featuring hundreds of artists, the 67-year-old painter has moved from Great Neck, her home of 35 years, to Bridgehampton, “the perfect place for an artist to live,” she said. Sometimes her experiences work their way into her art, like with “Despair,” a large and dark painting that shows a woman bowed. Born in London, Gribin was with her family on vacation in Switzerland when the Nazis marched into Poland. They escaped to America and arrived on Thanksgiving Day with visitor visas. “We had to go to Cuba and come back with permanent visas,” she said. Gribin grew up in Manhattan and began studying art at a tender age. The niece of the renowned Harold Salomon, chief sculptor for the king of Denmark, she obtained her degree in fine arts from Boston University. 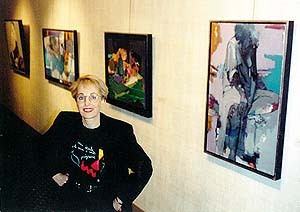 Her work has been exhibited nationally for many years, and she has received numerous awards and profiles in many publications. The only curator of the temple’s art gallery, Gribin remembers how that career began a little more than a decade ago. “They had just finished renovations in the temple, and the president asked me if I could contact some local galleries and get them to fill up the blank, newly painted walls with art,” she recalled. “Because I was in the art world and knew the people, I said I could bypass the galleries and go straight to the artists. Slowly the gallery evolved. Proper track lighting was hung, shows were staged – with the help of Gribin’s husband – and viewing hours set. In the beginning each show stayed up for one month. Gribin said people complained that wasn’t enough time, so the shows were lengthened to two months. Gribin calls Rabbi Robert Widom “the force” behind the gallery. “Whatever I needed he approved of,” she said. The rabbi says Gribin has added immeasurably to Temple Emanuel’s cultural life. “Thanks to Liz and her diligent and dedicated efforts, fine art was brought to our synagogue house, where it was thoroughly enjoyed by the members of the congregation and the community,” he said. Early on the shows were developed around a theme, and artists who fit the bill were contacted. For the High Holy Days, shows centered around Jewish experiences. The summer focused on nature. There were landscape shows and abstracts. Sometimes a show was based on a specific medium, such as Gribin’s last show, “my curtain call as curator,” she said. That was a small works show – small paintings, small constructions, small boxes. “I worked hard to produce shows of high quality that would be stimulating to the viewers,” she said. “I know she will project these qualities into every area of her life and continue to enrich all of us through her art,” he said. Liz Gribin’s work can be seen at the Mark Humphrey Gallery in Southampton and at the Nan Mulford Gallery in Rockport, Maine. This story first appeared in The New York Jewish Week, Long Island edition.